Winter can seem so long sometimes in this part of the world, but Lochcarron is already full of daffodils and other signs of Spring as we prepare to change to Summer season hours on Saturday April 1st. 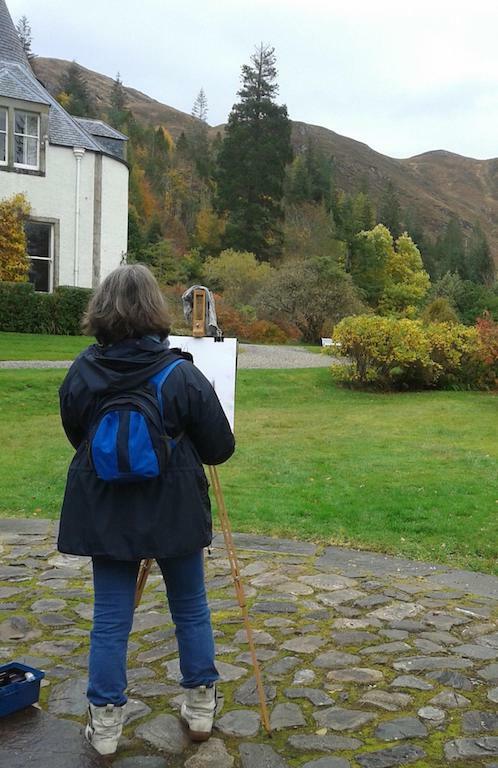 The day before that, on Friday March 31st, we have our last workshop of the Winter/Spring with artist Sarah Longley at Attadale Gardens. We’ll be exploring ways of depiction through careful observation. Rather than getting bogged down in botanical detail, the focus of this drawing day will be to work towards producing expansive, expressive studies. Using concepts such as ‘negative space’ it is possible to create a wonderfully atmospheric drawing. The shifting light and changing weather (just some of the challenges of ‘plein air’ drawing) should invigorate your drawing, encouraging speed and energy. At the end of the day we will discuss how the studies may be used as ‘working drawings’ to develop into larger drawings or paintings. It will be an enjoyable, experimental workshop open to anyone interested in drawing. This is a rare opportunity to spend time drawing in the Gardens at the start of the growing season when they are not open to the public. The workshop will run from 10am to 4pm. Tea, coffee and biscuits will be provided in the dining room of Attadale House where you’ll get the chance to view the impressive painting collection. Please check out our Facebook page if you’re interested to see if we have any places left. Our workshops have been very popular and, as well as Sarah, we have been lucky enough to work alongside Suzie Mackenzie, who’s a very talented printmaker. Suzie spent two days with us in February and took us through the process of making collagraph prints. Collagraph allows a wide selection of mark-making, with a huge range of materials, everything from card and coloured paper to sheep’s wool and glue. Suzie’s work can be seen at the gallery and she will be our featured artist later this year. We also had two more workshops with water-colour artist Steven Proudfoot who has been working with a group of keen artists over the last few months. It’s been good to see everyone build up their skills during the workshops and gain more confidence in their abilities – but most of all great to have fun. Over the summer we are planning more art activities. As well as Sarah’s workshop we’re planning running some sketching days and will be sending out a short survey to find out if people would be interested in short courses or classes during the summer. Please contact us via email or message us via our Facebook page for more information, if you would like to be added to our email list so we can let you know about activies, workshops or exhibitions or to see some more photos of our art, makes and workshops.